Sometimes, mother nature doesn’t seem to want to cooperate with your desire for a perfect golden tan. Just because it’s a cloudy day doesn’t necessarily mean you can’t achieve a great tan. Can you tan through the clouds? Read on, and we’ll take a closer look at the facts behind tanning on a cloudy day. What Causes a Sun Tan? Can You Tan Through a Window? How Do You Get Tan In The Winter? How to Tan on a Cloudy Day? The electromagnetic spectrum is the way that scientists describe all of the different types of light in the universe. All light is generated by electromagnetic radiation. There are also many kinds of light that we can’t see with our eyes. In fact, the majority of light that exists can’t be seen at all. For tanning, we’re going to be concerned with two types of radiation on the electromagnetic spectrum. These two types of radiation are responsible for the appearance of a tan. Ultraviolet (UV) rays are the types of radiation that causes a tan. While these rays can be replicated by certain lights, like a tanning bed, for example, the sun is the most abundant source of these rays. While we can’t see these UV rays with our eyes, they’re always present when the sun is out, even if the sun is hidden behind the clouds. UVA rays are the most prevalent, and as much as 95% of the radiation from the sun comes to us in the form of UVA. These rays penetrate deeply and can pass through both the dermal and epidermal layer of skin. UVA light is also the kind of light you’ll find in a tanning bed. In fact, the high-pressure lights of a tanning bed emit as much as 12 times as much UVA as the sun does. UVB rays don’t penetrate the skin as deeply, and can’t reach further than epidermal layer of the skin. While these kinds of rays are much less abundant than UVA, they’re the primary cause of sunburns. While the sun is always emitting UVB rays, in the United States, more UVB rays reach the earth between 10 am and 4 pm than at other times of day. We know that exposure to the sun leads to a tan, but how? When we’re exposed to the sun, our bodies respond by producing more melanin. Melanin is the compound in your body that gives your skin its color. Not only does melanin give your skin color, but it also helps to protect the deeper layers of your skin against damage from UV rays. When you’re exposed to the sun for a prolonged period, your body produces more melanin to try and protect your skin from the effects of the sun. 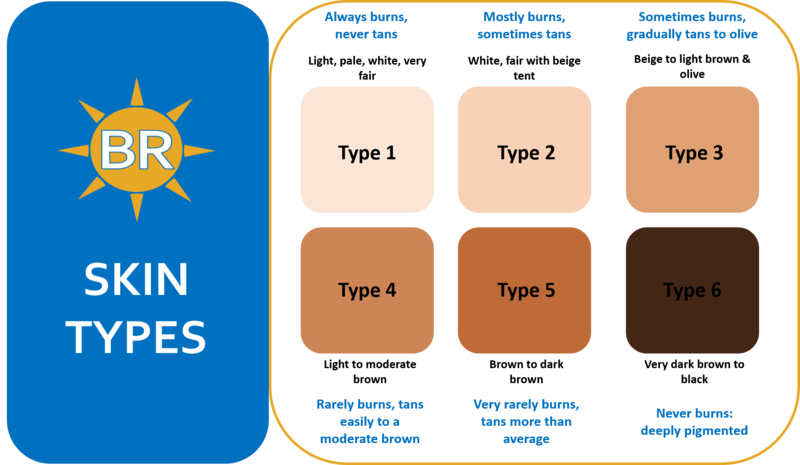 As a rule of thumb, people with darker skin will become darker when exposed to the sun, which leads to a nice, even tan. Meanwhile, people with lighter skin tend to turn red and burn when they’re exposed to the sun. Some people tan unevenly and develop spots or freckles when they’re exposed to the sun. This usually occurs more frequently in people who have lighter skin. While most people with fairer skin tend to burn when exposed by the sun, some lighter skinned people manage to achieve a beautiful bronze glow when they tan (especially when using tanning oil). Do clouds block the sun’s UV rays? Or, do clouds intensify the sun’s rays? Believe it or not, almost all of the UV rays from the sun can penetrate through the clouds. About 87% of the sun’s rays can penetrate through the clouds and reach the earth. Plus, they can easily penetrate through fog and mist as well. 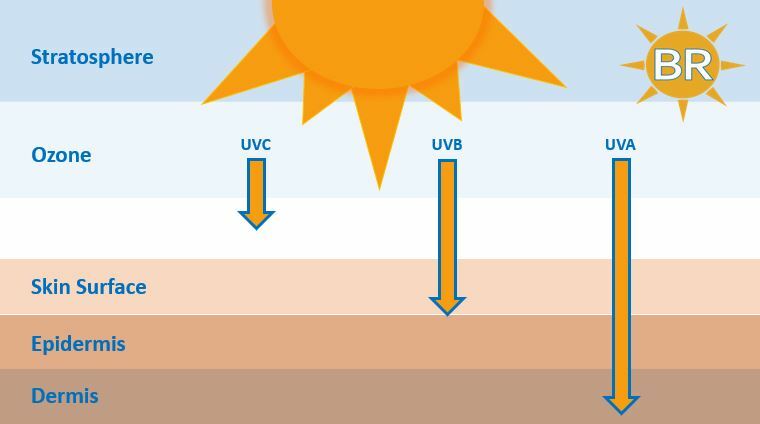 So, while the level of UV rays reaching the earth is slightly less intense on a cloudy or foggy day, if you’re wondering if you can you tan through the clouds? Keep in mind that the type of clouds in the sky play a role in how much UV light reaches the earth. Thick grey storm clouds absorb much more of the sun’s UV light than white fluffy clouds. So, if you’re looking to tan on a day where it looks like it may start raining at any moment, you won’t have as much luck as you would if it was a mostly cloudy day with lots of white clouds. If you’re wondering can you tan through glass, the answer to that question is also yes. Glass does act as a sunscreen, and some of the UV rays from the sun are blocked by windows. In fact, windows can completely block the UVB rays from the sun. But, UVA light can still pass through windows, so you can achieve a tan indoors, or if you’re on a long drive with the sun coming through the windshield. If you’ve ever gone skiing or snowboarding, you’ve probably noticed that you can develop a nasty sunburn on any exposed skin if it’s a sunny day. Snow reflects the UV rays of the sun back towards you, so not only are you receiving UV rays directly from the sun, but the rays can reflect back off the snow and onto your skin once again. Plus, higher altitudes also increase the intensity of UV rays. For every 1,000 feet of elevation above sea level, the sun’s UV rays become 4% more intense. If you’re heading to the slopes, consider wearing a high SPF broad spectrum sunscreen to protect your face from the sun’s rays, unless you’re into the idea of ski goggle tan lines. If you’re determined to achieve a golden glow, clouds won’t foil your plans. But, there are some steps you should take to ensure you get a nice, even tan through the clouds. First, you’ll want to keep in mind the negative effects of sun exposure. There is no such thing as a safe tan, and tanning regularly may lead to premature aging, eye damage, and an increased risk for skin cancer. Before you get started, make sure you have a good pair of sunglasses that completely block the sun’s rays. Many sunglasses offer complete UV protection, but this isn’t always the case. Many of us wrongfully associate how dark the lenses of sunglasses are with how much UV protection they offer. Meanwhile, there are plenty of very dark sunglasses available that offer little in the way of UV protection. If you’re not sure if your sunglasses block UV rays, consider buying a pair that definitely blocks the sun. Next, apply a broad spectrum SPF sunscreen on all of your exposed skin. A low SPF sunscreen will offer the best of both worlds because you’ll be able to protect your skin somewhat, but also achieve a nice tan. You’ll tan more slowly this way, but you’ll also be able to avoid a sunburn, too. Re apply the sunscreen every two hours to make sure you’re always protected. And if you forget an application or too and get sunburned here are some great aloe vera gels with trustworthy ingredients. Keep in mind that your skin produces melanin for up to 48 hours after you’ve exposed yourself to the sun. So, your tan may not show up instantly. If you don’t tan well, or if you’re concerned with the long term effects of sun exposure, there are plenty of steps you can take which will offer some protection against the sun, and help limit the potential damages associated with sun exposure. First, shave. You wouldn’t think that shaving to be the first step here but getting your body silky smooth for an even sunscreen application can ensure you don’t burn in weird areas. We recommend starting with a few of these bikini trimmers. Not only does shaving help with getting your skin smooth, but when failing to shave before sunscreen application it can actually cause irritation and razor bumps later in the day. It’s not difficult to get rid of razor bumps, but we’ll admit it’s easier to just shave beforehand rather than after a long day in the sun. Wearing sunscreen is an effective way to protect yourself against UV rays. The effectiveness of a sunscreen is measured by the product’s SPF or sun protection factor. SPF is measured by how long it would take the sun’s UVB rays to burn your skin, compared to skin with no protection. For example, an SPF 15 sunscreen will allow you to remain in the sun 15 times longer without burning compared to no protection at all. Higher SPF sunscreens provide even more protection, and are perfect for people who don’t tan well, are especially sensitive to the sun, or anyone who is at high risk of developing skin cancer. While these higher SPF sunscreens will protect you more from the sun’s rays, they also limit your ability to achieve a tan. Depending on your needs, you’ll have to decide what the proper SPF sunscreen is for you. Many people who use sunscreen still manage to end up with a sunburn, despite thinking that they took proper precautions against the sun’s rays. This is almost always because the sunscreen hasn’t been properly applied. To make sure that your sunscreen is effective, you’ll want to apply the sunscreen to every area of exposed skin. If you’re wearing lightly colored clothing, apply sunscreen underneath your clothing as well. The effectiveness of sunscreen degrades over time, as well. Be sure to reapply sunscreen every two hours to ensure that you’re protected. If you go swimming, or if you’re sweating excessively, you’ll want to apply the sunscreen more often. These days, there are some new and exciting products that offer UV protection from the sun, without the need to apply sunscreen directly to your skin. These Sunscreen pills allow you to protect yourself from the sun quickly and easily, and you won’t have to worry about reapplying them every 2 hours, or if you’re exposed to water. Sunscreen uses a variety of different ingredients to protect you from the sun. These ingredients fall into two categories: chemical and physical. Chemical ingredients form a barrier over your skin, and they absorb the UV rays from the sun before they’re able to penetrate your skin. Physical ingredients are particles which reflect the sun’s rays away from your skin so that they cannot reach your skin. Most sunscreens contain both chemical and physical ingredients to protect you from the sun’s rays. Keep in mind that many sunscreens only protect your skin from UVB rays. If you’re looking for protection from all of the sun’s rays, you should opt for a broad-spectrum sunscreen. Broad-spectrum sunscreens protect your skin against both UVA and UVB rays. If you’re looking to receive protection from UVA rays as well, look for a sunscreen that contains one or more of the following ingredients: avobenzone, ecamsule, oxybenzone, titanium dioxide, or zinc oxide. If you have particularly sensitive skin, you may find that your skin reacts to certain ingredients in the sunscreen. For example, many people are allergic to metallic ingredients, such as titanium dioxide or zinc oxide. If your skin is sensitive, you may want to look into a different brand. The clothes you’re wearing can also offer you protection from the sun’s rays. Keep in mind that UV light can penetrate many types of fabric, especially if they’re lighter in color. For example, a white t-shirt only offers an SPF of 7, and that number drops by more than half if the shirt gets wet. So, you can still get a tan or a sunburn through a shirt. One way you can increase the protection that clothing offers are to wash your clothes with a laundry additive like Sun Guard. Using an additive like this will dramatically increase the level of sun protection you receive from your clothing. Some clothing brands even offer apparel that offers protection from the sun. The level is protection is measured by UPF, which is the ultraviolet protection factor. For example, an article of clothing with a UPF of 30 will only allow 1/30th of as much radiation to penetrate the clothing. Many of the laundry additives available provide UPF 30 protection once you’ve washed your clothing with them. Even if your clothing doesn’t offer UPF protection, knowing how different fabrics react to the sun’s rays can help you stay protected. Dark or brightly colored fabrics reflect away more of the sun’s rays than lightly colored fabrics do. Also, loose-fitting clothing offers more protection from UV rays than clothing that is more fitted. You also may want to consider wearing a wide-brimmed hat to offer additional protection from the sun’s rays. Also, always wear sunglasses that offer UV protection to protect your eyes from the damaging effects of the sun’s rays.